In partnership with the Sodexo Corporation, we participate in the National School Breakfast and Lunch Programs. We are dedicated to feeding students nutritious, balanced meals based on the USDA Healthy, Hunger-Free Kids Act of 2010. Following these nutrition standards, we offer low-fat and fat-free milk, whole grain-rich products, and a variety of seasonal fruits and vegetables daily. Breakfast is served daily at Morse, Hill, Wattles, and Troy Union Elementary Schools, along with each of our secondary schools. If you qualify for free or reduced lunch, you also qualify for free or reduced breakfast. All snacks served during the day on school property also must follow USDA guidelines “All Foods Sold in Schools” Standards. We follow these Smart Snacks Standards to comply with these new guidelines. Food Service is Now Hiring! Our Department, which is contracted by the Sodexo Corporation, is seeking friendly people willing to fill various vacancies within the Food Service Department. 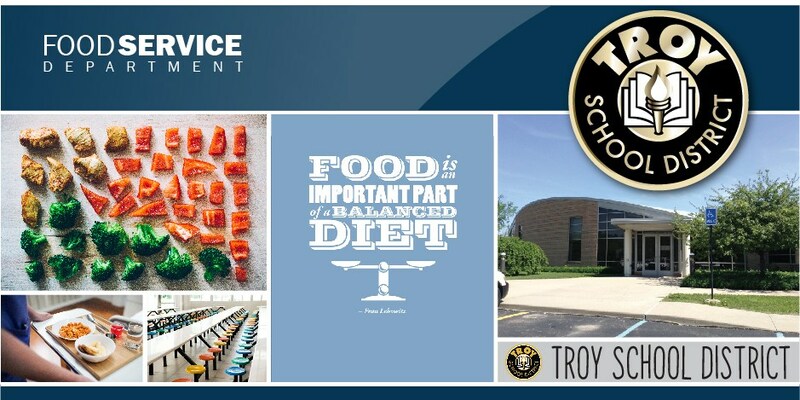 If you would like more information on the positions available, please call our office or send an email to ngervais@troy.k12.mi.us. If you would like to apply, please click here.